Tambahkana pineapple, apples, tomatoes and sledri shaft, then add mayonnaise and stir until evenly distributed. Arrange the lettuce leaves on a serving dish, arrange the salad mixture topped with decorative and finished with piterseli. Chicken salad hawaiian was ready to serve at the dinner table. 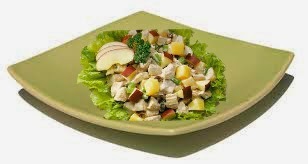 Thanks you have read the article about Chicken salad hawaiian diet menu [recipes]. If you want to duplicate this article you are expected to include links https://www.gaweenak.web.id/2014/10/chicken-salad-hawaiian-diet-menu-recipes.html. Thank you for your attention.